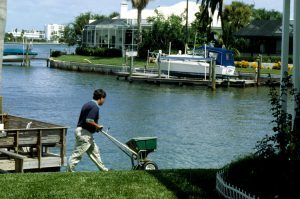 This training provides landscape professionals more in-depth knowledge about fertilization than the Green Industries Best Management Practices program, and includes skill-building opportunities related to proper fertilization. This training emphasizes the minimization of nonpoint source pollution to conserve and protect Florida’s water resources. It covers the characteristics of common fertilizers, the effects of pH, temperature and moisture on release rates; the calculation of application rates; spreader calibration and application techniques. It also covers safe fertilizer handling practices and how to handle fertilizer spills. CEU’s: 2 FDACS, 4 FNGLA, 4 ISA & 1 CFE (CAT 1). Cancellation policy: A refund request must be made in writing within 5 business days of the class date. All cancellations are subject to a 25% cancellation fee. Registration is by credit card only, if you are unable to pay by credit card please contact cesar.peralta@dep.state.fl.us or call 239-530-5951 to register. CAN'T FIND A FACT SHEET? | eMail me: dougbug@ufl. edu | Doug has been with the University of Florida | IFAS Extension, Collier County Public Services, as the Commercial Landscape Horticulture Educator in Collier County since 2001.